The new 2014 Alfa Romeo 4C will make its British debut at the 2013 Goodwood Festival of Speed this July and will also make its track debut on the famous Hill Climb course. The Launch Edition of the beautiful new compact supercar was first showcased at the Geneva Motor Show earlier this year as a spiritual successor to the 33 Stradale. The Alfa Romeo 4C is a mid-engined, rear-wheel drive compact sports coupe that exudes Italian style in a way the company hasn't done in years. The car is only four meters long, two meters wide, and 118cm high (157.5 x 78.75 x 45.5 inches) and is incredibly aerodynamic with a body size that promises extreme agility. We'll find out about that in July when it takes the Hill Climb course. The 4C sports an all-aluminum, direct-injected 240 horsepower, 1750cc turbo gasoline engine that puts out 350Nm of torque. This gives the car a power-to-weight ratio of 250 horsepower per ton. All of that runs through an Alfa TCT transmission, giving it a top speed of 155 miles per hour and an impressive 0-60 mph time of just 4.5 seconds. 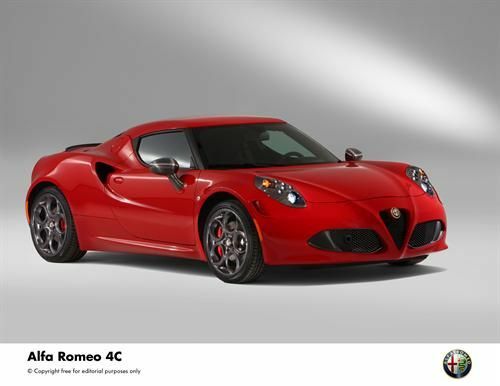 To attest to its nimbleness, it's lateral g on corners is only 1.1 and braking deceleration tops out at 1.25 g.
In size, power, and dynamics, the Alfa Romeo 4C promises to be very much like the favored Ferraris of the 1980s, with their small size, powerful mid-engined performance, and extremely tight steering. The 2013 Goodwood Festival of Speed takes place on July 12-14 and will feature track debuts of many great cars as well as a lot of classics returning for a day in the sun.